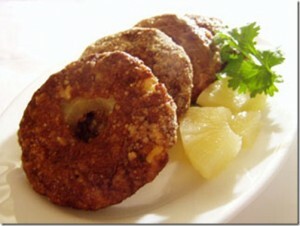 Chicken Doughnuts recipe by Sana Zehra Rizvi at DesiRecipes.com. For dough, Mix all above mentioned ingredients together, and knead with a soft dough. Leave it to rise for an hour. Make it into round doughnut shapes. Fill with filling, cover tightly and keep to proof till double about an hour. Then dip in beaten eggs and deep fry. For filling :Saute chicken in butter, add onions, salt , black pepper , ajinomotto , add flour and remove from the fire. Cool mixture then add in chopped cabbage , green chillies , corriander leaves and spring onions. Fill the filling in doughnuts and fry. Kuch samjha nahi i is ki k ya hai kia hai? I would like to try this recipe but I agree with "Anonymous", terrible instructions! How do you fill the doughnuts with the chicken filling? This recipe has terrieble instuctions.